Annie Wilson, Jacobean Tapestry (The Tree of Life), wool embroidered on to linen. Collection of the Sarjeant Gallery Te Whare O Rehua Whanganui. Gift of Lady Wilson, 1922. 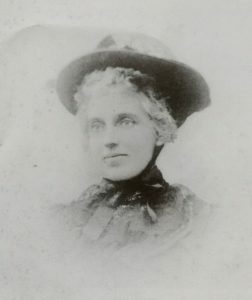 Photograph of Annie Wilson, née Adams. Courtesy of Hilary Haylock. As part of the Transition Project, which concluded at the end of last year, the entire collection of the Sarjeant Gallery Te Whare o Rehua Whanganui was inventoried and relocated to a temporary off-site location on Tāupo Quay. Among the exciting rediscoveries that were made as part of this process was an embroidery by local craftswoman Lady Anne (Annie) Wilson of Bulls. While little was previously known about this item, its interesting story has recently been revealed. The daughter of a successful Australian pastoralist, Anne Wilson (née Adams) was born at Greenvale in Victoria on 11 June 1848. In January 1874 she married James Glenny Wilson and the couple moved to New Zealand, establishing Ngaio Station and a homestead, Lethenty, in the Rangitikei block at Bulls. The couple had five children in the years that followed. In addition to being a wife and mother Annie was a published writer, contributing to several international journals after 1875 under the pseudonym ‘Austral’. She later published two books of poetry, Themes and Variations (1889) and A Book of Verses (1901), and two romantic novels, Alice Lauder (1893) and Two Summers (1900). Annie is also remembered as a keen gardener, winning numerous awards at local flower and agricultural shows, and as a skilled needlewoman. Her needlework was used not only to furnish her own home, but those of others, including some that she donated during World War I to be sold or auctioned as fundraisers. She passed away at Lethenty in 1930. One of two embroideries that Annie gifted to the Sarjeant Gallery in 1922 was a beautiful crewel embroidery in the Jacobean style. The term Jacobean refers to the period 1603 to 1625, the reign of James I on the English throne. It was during this period that crewel embroidery, a technique characterised by the use of two-ply wool yarn and the variety of stitches, first flourished in Britain. The technique was later revived in the late nineteenth and early twentieth centuries during the Arts and Crafts movement and the Jacobean Revival. In addition to employing a technique synonymous with Jacobean textiles, Annie was also influenced by their traditional subject matter. Ancient in origin, the ‘tree of life’ motif is believed to have been introduced to Britain from Asia. While traditionally shown as a tree fixed in a pot or mound surrounded by animals, Jacobean designers and their followers often adapted the motif to their own ends, utilising the twisting branches to form a continuous pattern and stylising the leaves and flowers. This can be seen in Annie’s work, where the elegant curves of the tree drip with leaves, unusual fruits and exotic, almost fantastical looking flowers of all shapes and sizes. Echoing the tree of life’s traditional association with fertility, these wandering curves also teem with insect and bird life, including butterflies, a snail and a caterpillar. Other known examples of her work include an altar frontal embroidered for St Andrew’s Church in Bulls, as well as a number of wall hangings, screens, and altar frontals to Jacobean and William Morris-influenced designs that are today held in private collections. The author would like to thank Hilary Haylock and Sarah Pickering, descendants of Annie Wilson, for their assistance in researching this article.